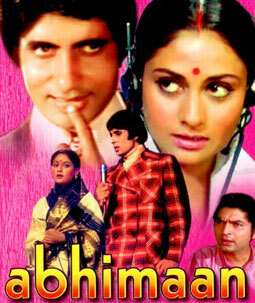 \\\"Teri Bindiya Re\\\" is beautiful romantic song from 1973 film Abhimaan. Great Mohammad Rafi and Living Legend Lata Mangeshkar has given their voice to real life couple Amitabh Bachchan and Jaya Bhaduri (now Jaya Bachchan) for this song. Music of Late S. D. Burman is excellent and Late Majrooh Sultanpuri has written this song to make it all time favorite.